Here’s a little Sci-Fi gem for you…Illegal Alien by Robert J. Sawyer. 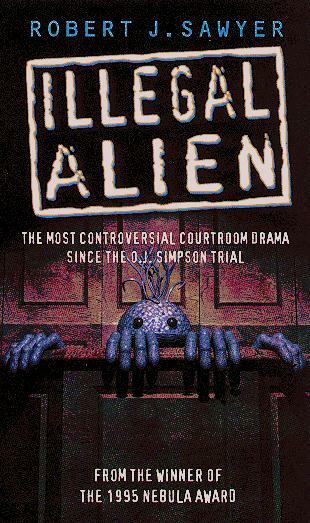 Written in 1997, Illegal Alien is not the story of migrant workers working under the radar in America, but rather a story of first contact between humanity and an alien race know as the Tosok…and the resulting murder trial. Ahem, what? When a small craft lands in international waters, the United States scrambles to quickly get a representative on-scene, in the form of Clete Calhoun, astronomer and celebrity host of PBS’ “Great Balls of Fire”, a documentary show akin to Carl Sagan’s “Cosmos: A Personal Journey.” He and Frank Nobilio, the presidential science advisor manage to Intuit the blinking lights atop the craft as an attempt at communication, and very shortly, they have an honest to goodness alien life form to chat with. It seems that the alien, who introduces himself as “Hask”, is the caretaker of an interstellar exploratory probe from the neighbourhood of Alpha Centauri whose crew has travelled to Earth to “introduce” themselves. However, these explorers fell victim to an accident while traversing our Solar System which damaged their craft and killed one of their crew. In exchange for access to mankind’s manufacturing capacity, the Tosok offer an exchange of technology that could propel the human race light years (no pun intended) beyond where we’re at now. And then Calhoun ends up dead, murdered in a fashion that can only be explained by the use of alien technology, and Hask is the prime suspect. From there, the story revolves around the resulting trial and the implications of arresting not only a foreign diplomat, but one whose race could literally wipe out humanity. Unfortunately, at the moment Illegal Alien is out of print, but if you get a chance to buy a secondhand copy, or read it at the local library, you won’t be disappointed.